Located on a 100-mile stretch of barrier islands off the North Carolina coast, the Outer Banks offers a rare combination of beautiful beaches and southern charm to make your wedding unforgettable. From the feeling of sand between your toes to the gentle ocean breeze blowing through your veil, to the sound of the waves breaking in the background, it just doesn’t get more romantic than a wedding on the beach. Plus, your guests will enjoy your beach wedding almost as much as you. Once here, they’ll find an abundance of Outer Banks activities and southern hospitality to make their stay just as memorable. Seaside Vacations offers you the perfect setting for your wedding, reception and rehearsal dinner in the heart of the Outer Banks. Our selection of Outer Banks special event homes makes choosing your home the most hassle-free part of planning your event. Enjoy a romantic beachside ceremony and then a fabulous reception...right in your own home! When you choose a Seaside home for your wedding event, you and your guests will enjoy fully furnished and well-equipped accommodations—some with state-of-the-art amenities like gourmet kitchens with professional appliances, private pools (with their own Tiki bars! ), recreation rooms and HD televisions. From affordable to luxurious, condominium to private home, you can house your entire wedding party and family under one roof for a great price. 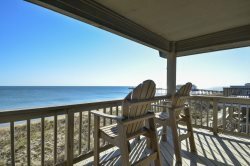 Plus, our Outer Banks vacation homes come with fully-equipped kitchens (perfect for preparing rehearsal dinners), master suites, multi-level decks, rec rooms, private pools, hot tubs and more. With Outer Banks vacation rentals in Corolla, Southern Shores, Duck, Kitty Hawk, Kill Devil Hills and Nags Head we can find accommodations that are perfect for your wedding event. For assistance with planning your next event, please phone us at (866) 884-0267 or email at [email protected].